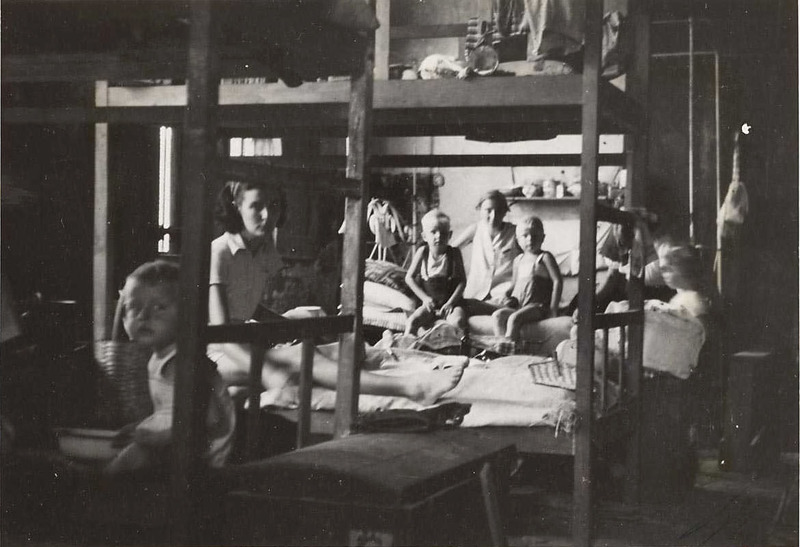 No photos exist that show the atrocious conditions in the concentration camps for Dutch women and children on Java under the Japanese occupation of the Dutch East Indies (now Indonesia) during WWII. The September 20, 1945 photos of Camp Banjoebiroe 10 in Central Java that you see on this web site were taken five weeks after the end of WWII during a whirlwind tour of the concentration camps by Lady Mountbatten, the wife of Lord Louis Mountbatten, Supreme Allied Commander of South-East Asia. With the Japanese guards vanished and no allied troops or relief organizations yet on the scene, Banjoebiroe 10 was in a disorganized transition stage, much better than under the Japanese but not yet fully free. Where would we go? 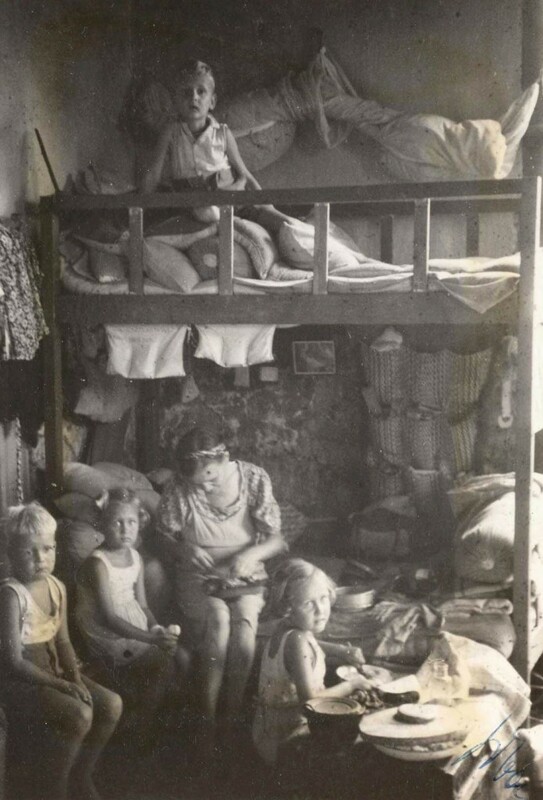 This young mother and her 4 children seem to be lucky in having such a secluded location in a corner of one of the barracks, but the reality most likely is that she is taking care of one or two orphans that were the children of her sister or a friend who died in the camp. This would have entitled them to this rare privilege and she has done a lovely job making the most of it. Two of the children would have slept on the top bunk bed and two would have slept on the floor using the bedding that is stored on the bunk bed. The typical configuration was a row of bunk beds side-by-side about 22 to 25 inches apart. I slept on the top bunk bed and I could touch the bed beside me lying on my back on that side of my bed. Horsing around with the child in the next bed was strictly forbidden, however, and nipped in the bud. Not only was it dangerous but it also interfered with the coming and going of the person in the lower bunk and was considered an invasion of someone else’s cramped space. Beds were not only for sleeping, they also served as dressing room, living room and dining room. Everything was done on your bed. To accommodate all this activity without constant territorial fights, the space on one side of each bunk bed was allocated to that bunk bed. The space on the other side was allocated to the next bunk bed, and so all the way down the line. Did this system work? Yes, mostly because there was no other fair way. Any fights usually were because of the children. Did we have any privacy? No.